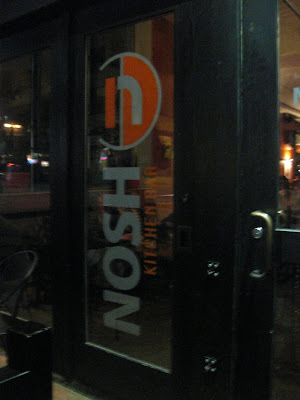 Friday night, before the awesome Sage Francis and B. Dolan show at Port City Music Hall, M and I went to Nosh for quick bite at the bar. He'd never been, and I was hoping to confirm the more positive reports I'd heard about the place (after a disappointing first visit). We sat at the bar (surprisingly empty for 8:30pm on a Friday night) and ordered some beers. I was happy to have a Shipyard Summer draft and after several attempts at ordering listed beers they didn't have, M. got a dirty Stoli on the rocks. We were excited to see soft shell crabs offered as a starter that night, and asked where the crabs were from (do they even serve soft shell ocean crabs? ), hoping the answer would be 'Maryland.' The bartender went to the kitchen to find out, and we heard a cook yell, 'down south somewhere!' Our bartender returned with the answer, 'uh... Maryland... down south somewhere.' Not exactaly the most confident answer from a place that seems to pride itself on high quality ingredients, but regardless, we were happy with our soft shell blue crab. The crab came tempura fried with thick hunks of crab meat and crunchy shell bits (sorry for the lack of food pictures). If you're unfamiliar with fried soft shell crabs, here's a good tutorial. For our main course, we split a Nosh burger and an order of salt and pepper fries (with cheese sauce, natch). The Nosh burger ($8) comes with blue cheese, bacon, a fried egg, and roast garlic jam. Everything was juicy and delicious (with runny egg yolks), but the roast garlic jam really turned me off. It took me a few bites to ID it, because the jam was so sweet. The fries were much better than I remember; crisp but soft and flavorful inside. 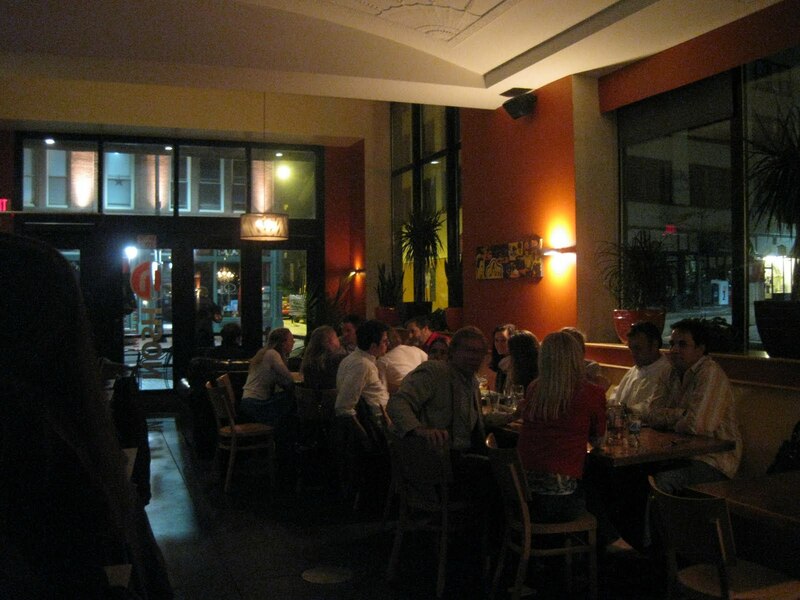 I came away with a much more favorable impression of the place. Looks like they've gotten it together. I've been there twice and the only thing that I would call excellent was the fries. A lot of promise here, but it needs work.